December last year, I wrote an article about London that was really special to me; but before London, there was Paris. 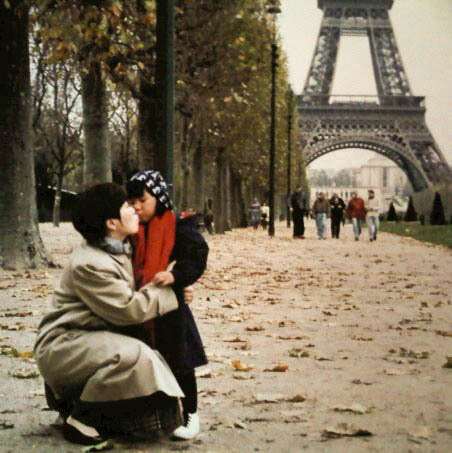 Paris was my first love. I don’t exactly recall my first time in the city because I was too young, I must have been in kindergarten; but what I remember was growing up visiting Paris at least once a year with my family. I used to shop for toys from Galleries Lafayette, bought my first ballet skirt from the Printemps, went to the 13th District for Vietnamese Pho and Laotian specialties, and my childhood snack was the BN Biscuit. Back in Bangkok, my mother would drop me off at Alliance Française every week for French Saturday school. The weekly routine started when I was five years old until middle school. During term breaks, my parents often suggested I take the Eurostar from London to live in Paris with our family friends. My familiarity with the city has grown thorough out the years. I know many chic local spots to dine, shop and relish. I find myself to be an expert in getting around Paris with public transportation. It’s almost like I lived here, but not really. Activities that I enjoyed the most in Paris when I was a teenager was going to museums, because they were free for anyone below 18 years old. My favourite was the Musée d'Orsay simply because I thought the Louvre was too mainstream. Other than that, I would find myself strolling in the Sephora and Galleries Lafayette’s beauty section, testing out product after product. It was around this time that I started to explore and experiment with a variety of makeup looks; and there was no better place to do it than in Paris. I also got into vintage fashion and artsy items which led me to the stylish shops not far from Centre George Pompidou. During my journey in Paris, I also met someone along the way. Jade was 17-year-old, and I was 14. My first impression of him was that he resembled the young version of Takeshi Kaneshiro. We knew each other from a mutual friend and started hanging out. One time he took me to café in Trocadero, where we could enjoy la tour Eiffel. It was also where he made me try my first tarte tatin! After, we decided to walk along the park towards the Eiffel tower because Paris is best enjoyed by walking, suddenly massive rain poured down and neither of us had an umbrella. We ran to the nearest shelter which happened to be a restaurant. I was starving from walking all day and ordered steak with fries. He was shocked at how much I could eat, but I didn’t care! You’d probably think these are scenes straight out of a romantic comedy, but sorry to disappoint you, we were just friends and we remained that way until today. I just want to capture these moments in my memory in my blog before they are forever forgotten. A couple of years later, I became distant from Paris. In fact, I avoided the city. Paris became mundane to me; I was sick of thieves and had some bad experiences. It’s like I had nothing else to explore. That is until May 2018, when I had to return for a business trip. Honestly, I didn’t expect much, my heart was already with London. It’s amazing how a lack of expectation can surprise you. I began to rediscover Paris again – the other side of the city, but at the same time Paris brought back childhood memories of past experiences like déjà vu. I was reminded of how I have always preferred the Paris metro over the London Underground, and how London does not have the RER equivalent that cuts from one side of the city to another. I was also reminded of how Parisians are generally more cultured and are aware of different cultures and languages. During my stay, I encountered a French who spoke fluent Mandarin, and another with Korean fluency. Having had conversations with some Parisians with my rusty French, I felt the sense that they assumed you understood them, their culture and saw you as their equals, rather than what I witnessed in America where many people tended to dumb down their level of English when talking to non-Americans or those with foreign accents. Moreover, Paris has that Indochina vibe that is embedded quite strongly into parts of Parisian culture, like meeting a French-Laotian waiter in a café on Champs-Elysées who conversed with me in Lao/Thai after he heard me spoke Thai. I felt strangely at home, like I belonged. Paris was where I experienced one of the best Thai northern and Laotian food – just like my grandmother’s recipes, something difficult to find even in Bangkok. Unlike London where most commonwealth Asians have the priorities, in Paris the feeling is special when my Laotian part is being represented. Honestly, I have always liked this side of Europe more, especially Paris, but because I matured in London and also because of the people I met there – London became my home. Yet, deep inside, I will always know Paris is where it all began. Paris has never failed to impress me even after all these years.